DESCRIPTION: Located on the southern edge of downtown Kansas City, Crown Center offers fine hotels, entertainment, dining, shopping, offices and residential living in the city’s burgeoning cultural arts and professional services district. The 85-acre complex, which opened in 1971 and serves as the international headquarters of Hallmark Cards, attracts more than five million visitors each year with two world-renowned attractions, SEA LIFE Aquarium Kansas City and LEGOLAND® Discovery Center, and boasts one of the largest flexible meeting spaces in the Midwest at Sheraton Kansas City Hotel and The Westin Kansas City. Crown Center is home to two theaters, MTH Theater and the nationally acclaimed The Coterie, and more than 40 shops and restaurants. Crown Center Square hosts large festivals and events and features a seasonal public outdoor ice skating rink. LOCATION: Southern edge of downtown Kansas City. Three levels of shops feature locally owned and operated specialty shops, anchored by Halls Kansas City, the region’s premier fashion destination. Connected access to two hotels—the 730-room Sheraton Kansas City and The Westin Kansas City with 724 rooms – puts you right in the center of the action. The Coterie Theater, one of two live entertainment venues, was recognized by Time as one of the top five children’s theatres in the country while MTH Theater produces Musicals, Cabarets and original Revues. Based on the ever popular LEGO® brick, the LEGOLAND Discovery Center provides a range of interactive play areas including a 4D cinema; master classes from the LEGO® Master Model Builder; an exciting LEGO® laser ride and more. The SEA LIFE Kansas City Aquarium transports you into the amazing underwater world. Come nose to nose with sharks and prepare for astonishingly close views of everything from humble starfish and seahorses to graceful rays. Free Creative Art Sessions offer children of all ages and their adults the chance to make their own amazing art together at Kaleidoscope. At the adjacent Hallmark Visitors Center discover how a teenager from Nebraska tucked two shoeboxes of postcards under his arms and set out to create an iconic company in Kansas City. Connected access to two hotels—the 730-room Sheraton Kansas City and The Westin Kansas City with 724 rooms – puts you right in the center of the action. HOURS: Shopping Hours: 10 a.m.-7 p.m. Mon.-Sat., noon-6 p.m Sun. Attractions and theater hours vary. 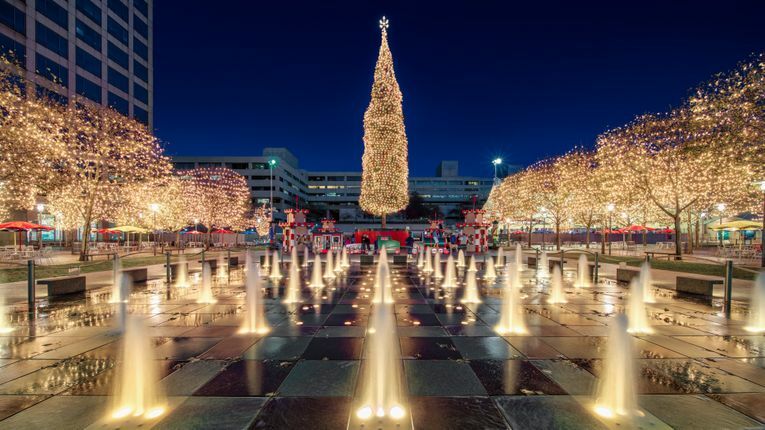 Visit crowncenter.com for holiday hours and closures. ANNUAL ATTENDANCE: More than 5 million visitors each year. HISTORY: Crown Center is a mixed-use redevelopment project, one of the earliest in the nation, filling an 85-acre site adjacent to the international headquarters of Hallmark Cards, Inc. It has been a catalyst for change in the city’s urban core, replacing blight with quality working, living and entertainment facilities to breathe life back into the city. Crown Center is the result of the vision of Hallmark’s founder, the late Joyce C. Hall, and his son, current chairman Donald J. Hall, to replace the rutted parking lots, abandoned warehouses and remains of failed businesses. Ground was broken in 1968 on the first projects, a five-building office complex, a central square and a parking facility. The Crown Center Shops, The Westin Hotel and The American came next, followed by residential, a second hotel and more office buildings. Today, Crown Center thrives as a place where people live, work, play and stay. WHERE TO GET LUNCH: Eating options range from the moderately-priced Fritz’s Railroad Restaurant—where meals are delivered by miniature train—to local favorites SPIN! Neapolitan Pizza and Unforked. WHAT’S NEARBY: Union Station and the National WWI Museum & Memorial. Holiday Season—Visitors can ice skate at the city’s only public outdoor rink, marvel at the 100-foot Mayor’s Christmas Tree or visit Santa in Santa’s Gingerbread Station. Festivals—Crown Center hosts large-scale outdoor festivals & events, including WeekEnder, HALLMARKET, the Kansas City Irish Fest, and KC Oktoberfest. DID YOU KNOW: Crown Center's six-acre urban residential neighborhood includes more than 200 condominium units, a social clubhouse, tennis courts, swimming pool and landscaped garden area, all located just south of the Crown Center Shops. At the southern end of the complex is Gallerie, a luxury apartment community built in contemporary fashion with exciting, modern living spaces and classic designs. DON’T FORGET: Your blankets and lawn chairs. Crown Center’s WeekEnder series features a live local music show followed by a crowd favorite film on a huge outdoor screen in Crown Center Square on Fridays in July. PUBLIC TRANSPORTATION: Take the MAX to the Crown Center stop (Pershing & Grand) or take the KC Streetcar to the Union Station stop (Pershing & Main). From Downtown: Take Broadway Boulevard south to Pershing Road. Turn left on Pershing and right. From the north: Follow I-35 South and exit at 20th Street. Turn left on 20th Street and go nine blocks to Grand Boulevard. Turn right on Grand Boulevard and continue to Crown Center parking. From the south: Follow I-35 North to the Broadway Boulevard exit. Turn south on Broadway Boulevard and follow to Pershing Road. Turn left at Pershing Road and go to Grand Boulevard. Turn onto Grand Boulevard and continue to Crown Center parking. From the east: Take I-70 West to Locust Street/Truman Road. Turn left on Grand Boulevard and continue to Crown Center parking. From the west: Follow I-70 East to I-670 East. Exit I-670 to I-35 South. Exit I-35 South at 20th Street. Turn left on 20th Street and go nine blocks to Grand Boulevard. Turn right on Grand Boulevard and continue to Crown Center parking. PARKING: Parking is free for the first three hours with validation in the Crown Center Shops garage, 2450 Grand Blvd., and weekend parking is free. PUBLIC RELATIONS CONTACT: Anne Deuschle, integrated marketing manager, 816-274-5916 or anne.deuschle@hallmark.com.